My husband was sent this cartoon on Facebook and he passed it on to me. It's supposed to be all one panel, but I split it up so the words are more legible. Amen. Isn't it a fact. 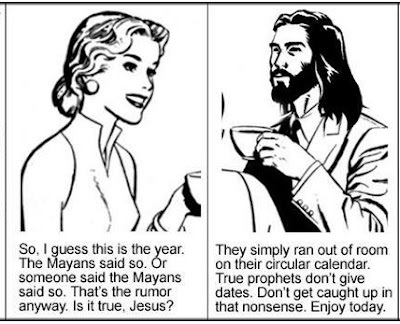 Jesus is right, of course. anon. 10:45 am ......dont really care a hoot about how long jesus hair was or was not...and patrice my husband said that if i knew today was indeed my last day on earth, i would still be making sure the beds were made, the floor swept and a pot of coffee on the stove....he on the other hand would probably be the one with the bottle. i think that the end of the world is likely to happen as a result of what we have done to it and not with the predictions of the mayans or anyone else. Now that is an honest and fun cartoon. 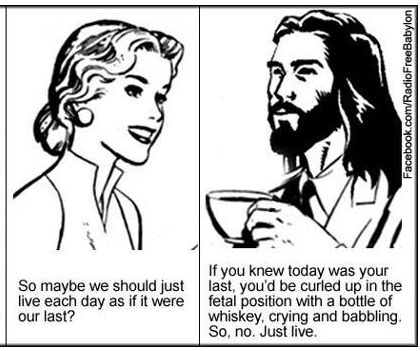 Don't think about it being your last day-Live each day as Jesus taught us-don't cram for the finals! Hey...a jazzy new comment format. I better be careful how I phrase my comments. Funny cartoon. I always love a chance to chuckle just for the sake of chuckling. I recently had a friend and a family member die different days in different ways. Both of them were there one day and gone the next without so much as the tiniest sign ahead of time. Made me realize there's no reason to fret over it. I've decided to live every day as if I was going to live forever. Why not? I can only be who I am and do what I do. Why change?